The dark bar on the nape of this birds neck suggests that it is an immature Black Legged Kittiwake. During the days we spent at Point Baker the humpback whales were feeding just off of the point. On quiet, calm mornings, the gentle music of seabirds is punctuated by the giant blow of a whale. A fog bank to the west is a phenomenon called a 'marine layer.' Recent warm weather with little wind has created the conditions for a marine layer to form over the cooler water. Humpback whale taking a breath. A marine layer slipping up over an island. The waters around Point Baker are busy. Sumner Strait makes a turn at that northwest tip of Prince of Wales Island, and an immense volume of water moves past with each tide. The tide rips, whirlpools, and eddies stir things up, making a rich feeding ground for fish, birds, and marine mammals. 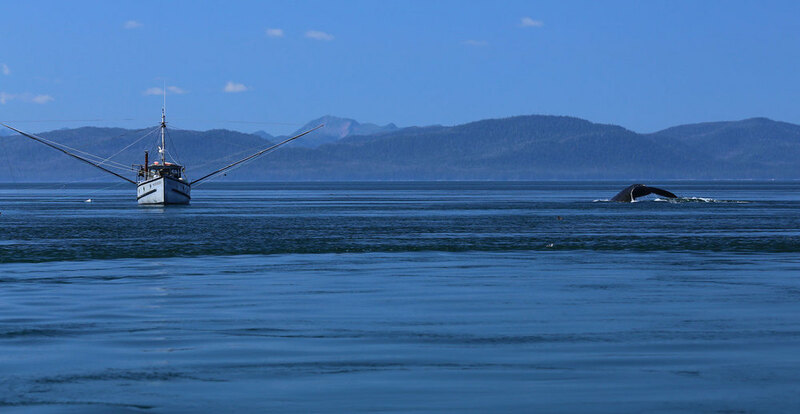 Subsistence, sport, charter, and commercial fishermen target the salmon that round Point Baker headed for the Stikine and other rivers. The fishermen and the whales do their best to stay out of each others way. Humpback whale tail with seaweed hitchhikers. The whales seem to understand that a troller moves along at one or two knots. They pass by the boats and go on their way. We did not see the whales bubblenet feeding in a group, but we did see one small whale feeding close to shore using the bubblenet technique. 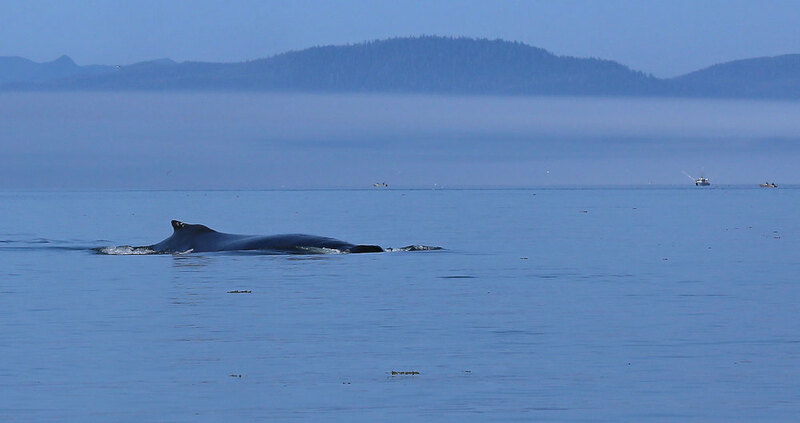 For the most part we saw individual whales blowing and diving, rarely even showing their tails. ...and keep their tail hidden in the water on most dives. 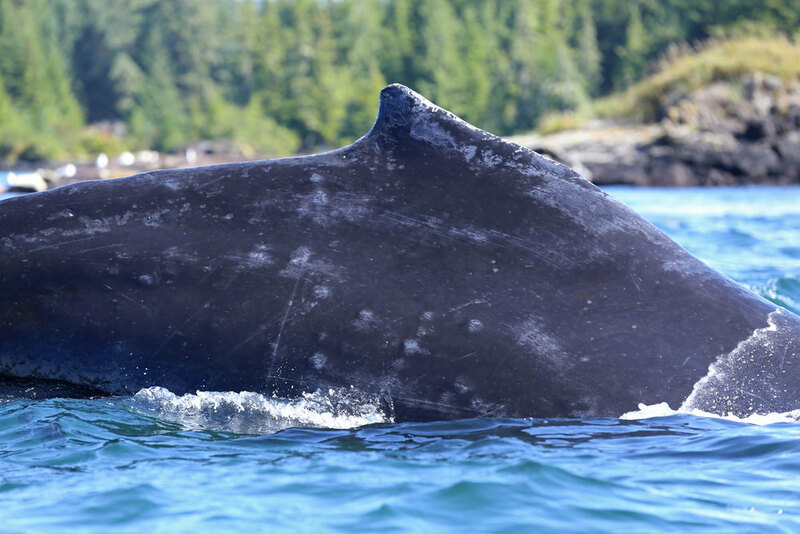 With the long lens I was able to see that whale skin has all kinds of marks and blemishes. All of my wishing for spectacular breaching and lobbing behavior was quieted happily when a whale blew a rainbow. Humpback whale blowing a rainbow. Hey, some days enjoying a little magic is nicer than the logical sun-angle/water-droplets explanation. P.S. There were a few sea otters around, too! Okay, more on that in a couple days. Sea otter in a bullwhip kelp bed. Would you like to see more whales?